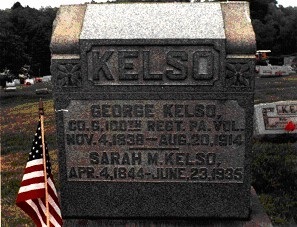 GEORGE KELSO was born November 4,1838, in Lawrence County, Penn., to John and Ann (McWilliams) Kelso, natives of Lawrence County, and of Scotch and Irish extraction, respectively. George was educated in the common schools, and brought up on a farm. He enlisted in Company I, One Hundredth Pennsylvania Volunteers, and served three years; was in the battles of his regiment and wounded in the right temple in front of Petersburg. His brother Joseph enlisted in Company G of the same regiment and served nearly four years; he was also wounded in the head. On his return from the war George worked on his father’s farm until married, February 8, 1865, to Sarah M. Walker, born April 4, 1844, daughter of Samuel and Eliza (Nelson) Walker. They were married at Deer Creek Presbyterian Church, Rev. Josiah Alexander officiating. 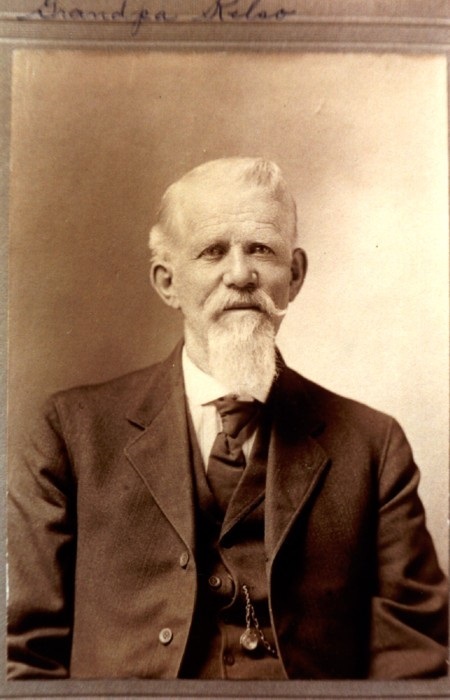 George and his wife settled on a farm in Lawrence County and then they came to own another farm in Mercer County known then as the Matthew Thompson Farm. They had eleven children: Robert A., Samuel, Johannah, Elizabeth, Joseph H., Mary, George, Nelson O., and William D. Two children, Ella Rebecca and Edwin Kelso died in infancy. The Kelsos raised 9 children and there were born 25 grandchildren, 69 Great-grandchildren, and 108 known Great-great-grandchildren. After serving for a year and a half in Company I with the Roundheads, George transferred from Company I to Company G, the Company in which his brother Joseph Kelso also served. George Kelso was wounded in his right temple outside Petersburg while on picket duty on 2 Jul 1864. He was hospitalized for over a month and was released with a “surgeons certificate” in August of 1864. His brother Joseph reenlisted and continued to serve with the regiment until the end of the war. The regiment was involved in the pursuit of Lee’s army to Appomattox where Lee’s army surrendered. It is of interest to note that George and Sarah Margaret named their firstborn son Robert Audley Kelso. Since that name was not common and was not a name handed down through the family it is believed that Robert was named for Robert Audley Brown who served as Chaplain for the 100th P.V.I. during the war. Also it is interesting to note that one Great-grandson, Dr. William Martin Kelso is the lead archeologist for the Association for the Preservation of Virginia Antiquities (APVA) which is leading the search for the original fort at the Jamestown Settlement in Virginia. His wife Sarah Margaret lived until 23 June 1935.